Osteopenia is a condition marked by a decrease in bone density and loss of bone mineral. This disease is often secondary to others, such as osteoporosis and osteomalacia. 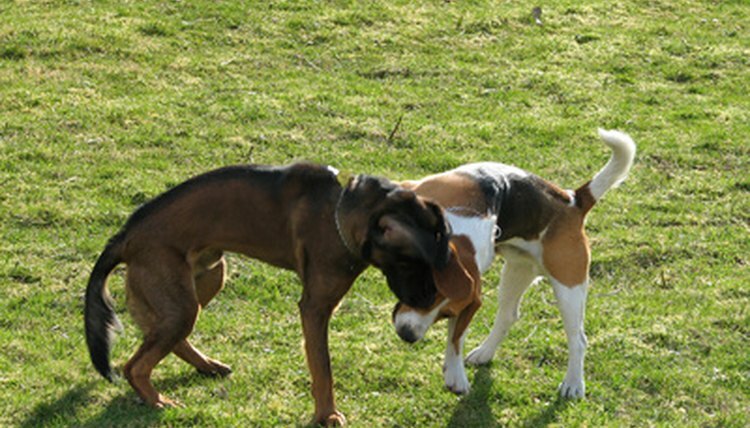 According to Gopetsamerica.com, osteopenia can result from Mucopolysaccharidosis, another bone-deficiency condition. Osteopenia is an abnormal mineralization of bone, usually the result of bone destruction that exceeds the rate of bone matrix synthesis. William Fenner, in his book “Quick Reference to Veterinary Medicine,” states that osteopenia is a radiographic impression of low bone density in your dog. The condition is generally not painful, though, in association with hyperparathyroidism, it may have clinical signs of discomfort. Common causes of osteopenia, according to Glendale Animal Hospital, are poor diet, vitamin D deficiency and certain diseases as renal disease, malabsorption, hyperparathyroidism, diabetes mellitus, hyperadrenocorticism and neoplasia. Diagnosis usually involves a complete physical examination and X-rays to exhibit any bone density problems and possible small fractures. A blood test may be drawn to check for the cause of bone weakness. Treatment for osteopenia centers on the cause of the condition and the bone loss. The treatment and dietary changes will often lead to improved bone density. Prevent further trauma to avoid new fractures.